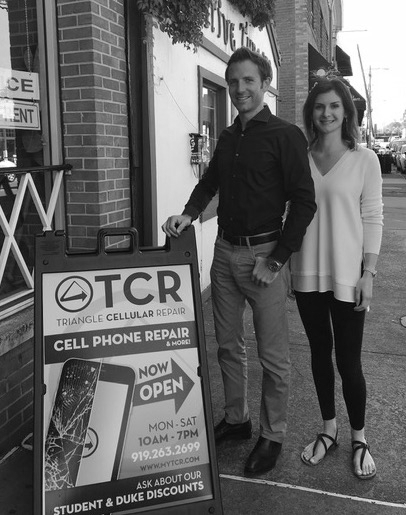 Nick Wisner, owner of TCR: Triangle Cellular Repair, and Ashley Greenleaf, the company’s Director of Operations, manage staff at six different locations throughout the Triangle. Still, they particularly love their cozy location on Ninth Street. For one thing, they’re right next door to a great cup of coffee at Triangle Coffee House and for another, these two are true Durham originals – born and raised in Durham and graduates of Durham Academy. Ashley attended Duke University while Nick attended Jacksonville University, where he earned a degree in Investment Finance. It was during Nick’s college years that the idea for his business started to gain momentum. While kayaking on Florida’s intracoastal waterway, Nick’s kayak was hit by a wave that soaked both him and his Blackberry. AT&T was able to replace his phone, but by then his friends had convinced him to get an iPhone instead. He sold the new Blackberry online for enough money to buy the new iPhone model (and then some). This kayaking mishap turned out to be the catalyst for a business model that would eventually become Triangle Cellular Repair. Nick started buying damaged phones from local retailers and selling them online. Eventually, he met wholesalers in Florida and started expanding into a business that provided contract refurbishing for insurance companies. He found himself fixing thousands of phones, but was doing it all out of a small apartment in Florida. His bedroom was filled with cell phones and cell phone repair equipment – not exactly an ideal warehouse! Soon, he moved back to North Carolina and started looking for a space to do his refurbishing. Though he only needed the space to function as a warehouse, the space he found in Olde Raleigh Village was zoned for retail, which meant that he needed a real sign in the window and regular business hours. Only after people started coming in with broken phones did the business become retail-oriented. The repair business grew quickly through word of mouth. Nick brought Ashley on in 2013 and the two of them worked seven days a week for several months until they could open their warehouse and hire more people to help them. Now, TCR employs thirty people. In a sense, Nick’s childhood prepared him well for his business success. Prior to buying and selling phones, Nick bought and sold stamps, a practice inspired by his grandfather, who gave eleven-year-old Nick his first stamp collection. A childhood steeped in model airplanes and model trains also gave Nick a tinkering talent that helped him learn to fix phones himself, rather than pay other people to do it for him. And it’s not just the tinkering side of the repairs that Nick enjoys. Extracting important voicemails or vacation photos from a broken phone can be quite rewarding, both for clients and for the staff at Triangle Cellular Repair. They’ve seen phones damaged by all manner of liquids: wine, coffee, tea, even potpourri wax. They’ve seen phones chewed up by dogs and phones bent in to the shape of it’s owner’s palm (yes, really). One client cut his phone in half while leaning over a table saw. His phone was ruined, but Triangle Cellular Repair was able to retrieve all of his data. According to Nick and Ashley, the very best part of the business is the customer interaction – getting to know the people who walk in to their stores. In that spirit, Triangle Cellular Repair partners with local organizations like Durham Public Schools, Ronald McDonald House, or Activate Good, a non-profit that organizes community service opportunities throughout the area. Whether they’re donating a device for an auction, providing a free charging station, or giving discounts to employees, Triangle Cellular Repair loves giving back to the communities that support them. Nick loves fine dining at Nana’s, but for everyday grub, he’s a die-hard Cosmic Cantina fan. Ashley has two favorite movies, Fight Club and Finding Nemo. Who doesn’t love a complicated woman? Tools of the trade they can’t live without? For Nick, it’s a trio of screwdrivers (tri-wing, Phillips, and pentalobe, to be exact) and the Protein Bowl at Happy + Hale. For Ashley, it’s her laptop and, of course, her hardworking team.